Perhaps someone can fill me in on the details of this concert and CD? Here are two tracks from the concert. The first is Bach’s Partita in E Major with Harris on mandolin. The second is Bach’s Concerto for Two Violins in D Minor (aka “The Bach Double”) with Juliana Trivers (I believe playing first violin?) 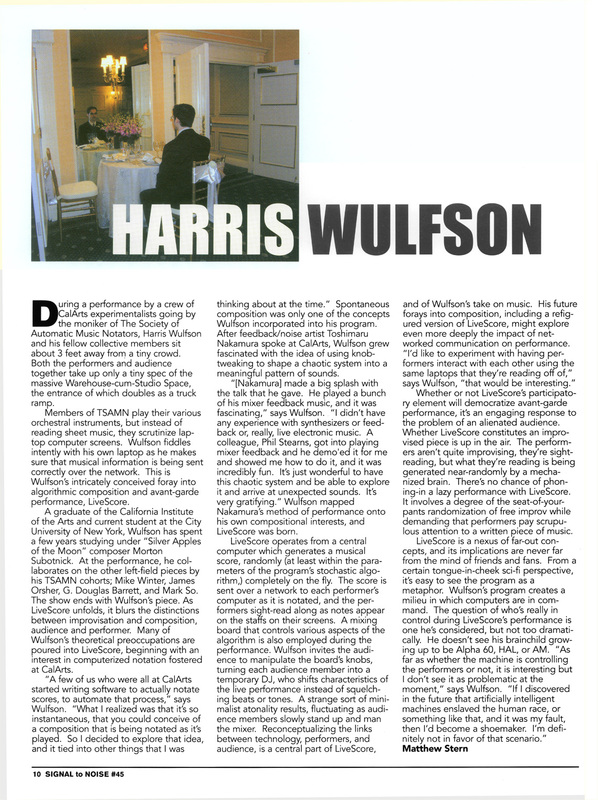 Harris (playing second violin? ), Wynn Yamami and Ryan Dorin on piano. Here are some more tracks Harris gave me a couple years ago. As you can see from the title, it was a sampling of what he was up to at the time. 01. I don’t know who is performing lookatmeiamafish, it does not sound like the same recording as the January 18th, 2006 performance. 08. I love his rendering of Eli Eli. If you click on the invitation to the left, you will link to the full program. As you can see, I am missing a recording of Canon and A Little Chamber Music. 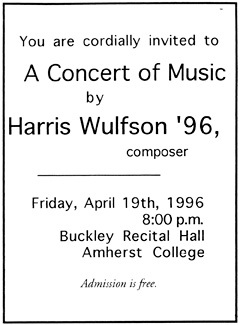 I DO, however, have sheet music and/or notations for everything listed as Harris published his undergraduate thesis. Since the performance also involved real time delay loops, video and some improvisation, I am hoping someone has a videotape recording of it. The first movement of this quartet is based on the Bulgarian Kopanitsa dance (with its 11/16 meter). The third movement takes Moravian song as source material. The piece is structured on the micro and macro level around the wedge shape formed by the ascending B, C#, D, D# and descending B, Bb, A, Ab. Digital delay with endless feedback and spoken parts. This “Quartet” makes use of a long (two minute) tape delay. 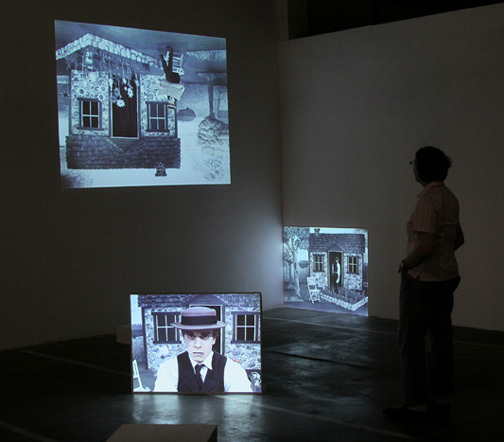 The passage recited from Foucault (ostensibly introductory) gets played back over the music, which is twelve-tone. The first track below was composed for Wallace Stevens’ Bowl, Cat, and Broomstick. 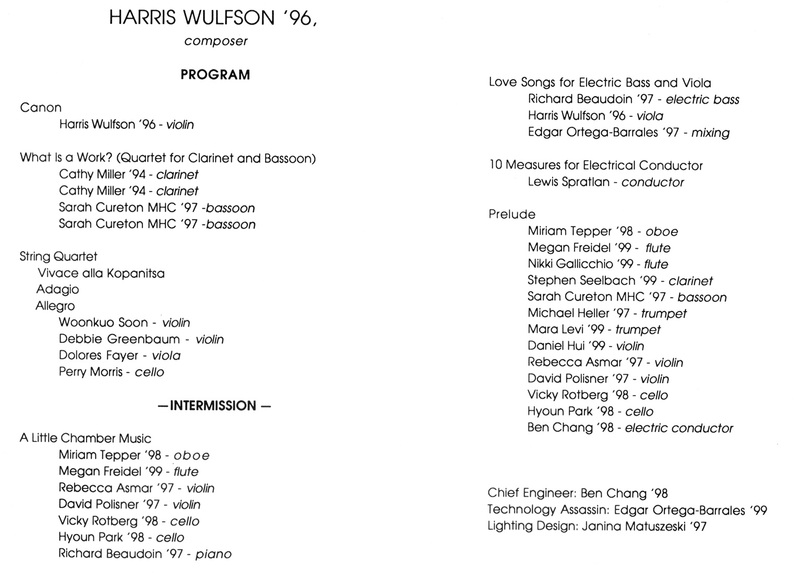 I found Harris’ note stating “This piece is comprised of three looped layers of music, which were mixed in and out live during the performance. This recording progresses through just layer 1, then 1 + 2, then 1 + 2 + 3 followed by just 3. I found and converted Harris’ DAT recordings of Dracula and also found some sheet music sketches. Conveniently, Harris left a track list that seems to align with the sheet music. Harris names are slightly different from the ones David provided above. Curiously, the tracks are listed from 2 to 11, not 1 – 10. The first 4 tracks below were on one tape and other 10 on another tape. They may actually be duplicates. For sure most of these tracks are duplicates from the ones I posted above with some minor exceptions and the addition of Carfax. I’ve scanned and posted the sheet music notes that I found in the order I found them in. They’re still a bit of a puzzle.